I've been working in a secondhand bookshop for the past few months, and the biggest perk of the job is getting first dibs on new and interesting books as they are unpacked. Many have come home with me because they're written by one of my favourite authors or because I know my children or my husband will love them. Once in a while I take one home not because it's a good book but because it's such a terrible one that I want to take it out of circulation. A slightly worn copy of Creating Kids Who can Concentrate was one such book. Firstly, to be fair, this edition of the book is from 1997, which explains why some of the information is out of date. It has been reprinted in the 00's and is now available on Kindle, so it's possible that later editions have updated the science. I certainly hope so. I thought it would be worth addressing some of the content of this version anyway since it's full of the same kinds of misinformation I frequently come across online today. I'm sure that the authors of this book set out to write it with good intentions, wanting to help children with behavioural issues to reach their full potential. However, as a teacher and children's librarian, while they probably have plenty of experience working with children they are both lacking in any medical qualifications, which is kind of a problem when you are writing a book about a recognised medical condition. And in case you were wondering, no I don't have any medical qualifications either and what I have to say is no substitute for medical advice. I'm merely a concerned reader who doesn't like to see anyone spreading stigma and misinformation which could make life more difficult for children and adults with ADHD. For the record, ADHD or Attention Deficit Hyperactivity Disorder (incorrectly referred to in the book as ADD because the terminology has since changed), appears in the DSM5 (Diagnostic and Statistical Manual for Mental Disorders, latest edition). There are three main subtypes of ADHD; Hyperactive/impulsive, Primarily Inattentive and Combined, so it's a little more complicated than people used to think. More and more evidence has been uncovered over the years to show that ADHD is a genetic neurodevelopmental disorder and is highly heritable , meaning that a parent with ADHD is likely to pass it on to their children. When a child is diagnosed with ADHD it is often found that one or both of their parents have it and many people, especially women, are diagnosed as adults. The authors of this book seem to believe that ADHD doesn't actually exist, though they never go so far as to come right out and say so. 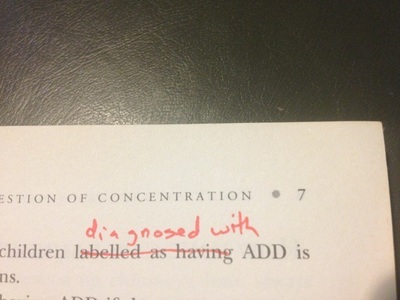 The book continually refers to "children who have been labelled as having ADD", when it would be more correct to say "children who have been diagnosed with ADHD", or even simply "children with ADHD". It's not a label, it's a diagnosis. You might as well talk about "children who have been labelled as having diabetes". In the opening chapter of part one the authors talk about the benefits of a holistic approach to ADHD. You'll get no argument from me on that point, and medical professionals also talk about the importance of approaching ADHD holistically, using a range of treatment methods including, but not limited to, meditation, coaching in time management, occupational therapy, herbal remedies, using fidget tools and exercise. So far, so good. But then the med shaming starts. "In a society which teaches children to say 'no' to mood altering drugs, we think that using drugs to alter a child's behaviour gives worrying messages to a vulnerable group." Here I have to disagree with them. There is a very big difference between illegal drugs, of unknown origin or quality, purchased from criminals, and medication with a controlled dosage and predictable effects prescribed by a doctor. "We believe that the danger for children being given drugs to calm them down is that they come to believe that they do not have to take responsibility for their own actions. They begin to believe they will always have to use the drug when they want to learn anything or behave reasonably. For these children, the pride in learning self control, self discipline and new skills for new stages of life has been taken away. Any improvement is seen to be as a result of the drug, not the child's learning or increased understanding." Here the authors appear to be simply making assumptions about how a child with ADHD will feel about being medicated. I wonder why they didn't simply ask some children or even adults with ADHD who are on medication whether it has ruined their lives and taken away all sense of pride in their achievements. If they did any such research it is not presented in this book. As it is all they do is speculate and increase the fears parents may have about medicating their children. Look, I can do the bold thing too. There are no facts here, only fear mongering. They do throw me a bone for a moment here with "In some children, ADD may be a medical problem", but continue with "...even for these children we do not believe that medication such as Ritalin, Tefranil, Cylert, Dexedrine, Elavel or orpramin, is the only answer" (p.10). The thing is, nobody thinks that. The authors of this book, like so many commenters in the media when the topic of ADHD is raised, seem to assume that it's an all or nothing deal- either you use medication or you use other methods but not both. That's actually a false dichotomy. You can certainly use both medication and other methods, and medication may enhance the effectiveness of other methods used. Taking medication also doesn't mean the patient has to take it forever. They can try it, and if they don't like it they can change the dose, change the type of medication, or just stop. There seems to be a lot of fear that if a child or adult is diagnosed he or she will then "have to" take medication. That is just not true. Adults with ADHD aren't forced to take medication and parents aren't forced to medicate their children. It's up to the individual or the parent under the advice of a doctor. 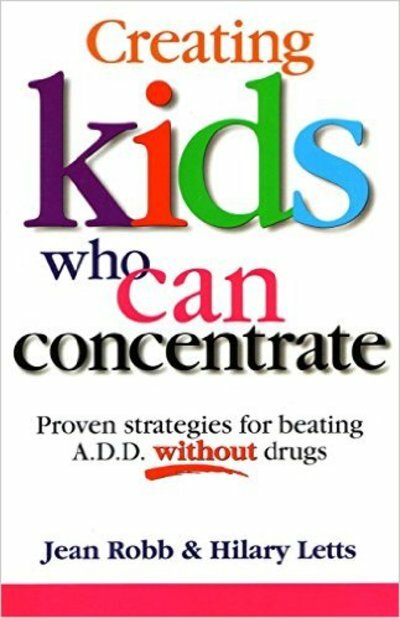 The authors go on to assert that if a child can concentrate in one situation then the problem cannot be with their concentration (p.14). This is wrong, and potentially very harmful. If you assume that the fact that a child is able to concentrate sometimes, under particular circumstances means that he or she would always be able to concentrate if only they try hard enough, then you condemn children with ADHD to be forever labelled as "lazy" when they can't perform to the required standard no matter how hard they try. This leaves them open to bullying and mockery for being unable to focus and forced to work much harder to keep up. It would be much more helpful to acknowledge that the problem exists and look into to ways to work around it. The comments about children with autism are bizarre and offensive. Whoa. Technically Asperger's Syndrome no longer exists according the the DSM5 (people who previously would have been described as having Asperger's Syndrome are now considered on the autistic spectrum), but even when it did exist, it didn't mean that people who had it couldn't have relationships at all. There are plenty of adults around today who were diagnosed with Asperger's as children who are now married, manage to maintain friendships, hold down jobs etc. The chapter on "bizarre behaviour" (they have a very tame definition of "bizarre") also stigmatises common autistic traits such as disliking eye contact and hand flapping (p.50). In other places the authors make other strange claims based using apparently circular logic. The chapter on guilt asserts that a child's behavioural problems may be due to birth trauma (p192). It then lists "Ways you can tell if your child's behaviour is due to a difficult birth". These include the child feeling insecure, difficulty asserting him or herself, difficult making decisions, sleep problems etc. It doesn't explain how a list of symptoms is meant to tell you what caused those symptoms, and no evidence is offered to back up their claims. The last couple of chapters include some information on basic relaxation techniques and finding support groups, which is at least constructive and helpful. However, overall it is an out of date, offensive piece of fear mongering tripe. If you do decide to buy a copy, please let me know if the later edition is an improvement. For a more scientifically accurate, up to date book on ADHD try Russell Barkley's Taking Charge of ADHD or Taking Charge of Adult ADHD. And if you suspect you or a loved one has ADHD talk to your doctor about it. There's nothing to be afraid of, and it might be the start of a new and better chapter in your life.